Bruno and Graig talking about Sindy being a lot cooler now. They agree she’s got to go. Pilar joins them. They talk about Johnny Birthday party tonight at midnight. He turns 27. She asks them what they have planned for Wednesday. Bruno says he’s voting with the house. Pilar agrees it’s the best plan. Graig and Bruno point out that Sindy is one of the stronger girls in competitions. Bobby thinks Wednesday is a double eviction because it’s such a wacky season. Bruno thinks it’s a bit early for that to happen. they start speculating about what the HOH will be. The plan is to have a surprise birthday party in the HOH room for Johnny. They tell Brittnee she’s good this week this week. They point out when you become the target people won’t look you in the eye. They agree it’s better to know you are going home. Bruno points out that Sindy knows she’s going home. Ashleigh – She definitely tried to campaign for a bit..
Ashleigh says Sindy slipped up at this point in the game people are looking for anything to put people up. Bruno – Nobody wants to divide the house right now it’s going to be a clean sweep.. see later then a HOH competition. Brittnee says it means a lot to her that they are keeping her she never thought she would meet people like this coming into the show. Bruno – You really connect with people.. I’ve known you all for what… 2 weeks and it feels WAY longer. Talking about the lack of game talk today and how nice it’s been. Bruno says Naeha and him talked about talking about game.. Feeds cut..
Bruno says he’s OK with AShleigh. Neaha comes up and to offer some slop chips she’s made. Zach says they are good he would eat them even if he’s not on slop. Bruno says Johnny and Naeha went to Graig and told him they want to target the young guys.. the young players. Bruno wonders if they are telling him that Because Graig isn’t young or not. Kevin says Sindy is still campaigning. She hasn’t talked to Zach at all. Bruno thought Sindy was done campaigning. Bruno asks him who is Kevin is worried about winning HOH. Kevin says Naeha, “She’s so f***g smart”. Bruno says he knows it’s mean but they will have to put Naeha on slop to make sure she’s weak for the Power of Veto. Zach and Kevin agree. Kevin says Godfrey and Jordan are on the same page to Get Naeha out. Bruno says he doesn’t know about Johnny points out that Johnny and Naeha are getting close they are always together. 8:39pm Kevin and Pilar skipping together. Neaha recommends before Wednesday she gets into Graigs ear and make sure he knows they are not going after them. She also wants her to mention that she talked to Naeha and they want to join up with Graig and form a powerhouse. Brittnee says it’s sketchy to talk right now. my guess is she is most likely to win any evicted HG comp, it won’t matter what type of comp it is other than popping balloons to find the right numbers or something. Sindy brought this on to herself. She is competition but has no social game? I am glad Cindy is leaving as I found her annoying. She keeps telling people she is beautiful. Maybe she is trying to convince us?, herself? Personally, I don’t see the supposed beauty, but maybe it just isn’t my taste. Last year’s beauty queen was a much better example of the traits required. She was a sweetie! But Cindy is good at comps and she isn’t completely evil, so I can’t hate her. She’d be good to go a bit further and then get cut. Ugh typical guys thinking that they can manipulate the younger girls. Hopefully its not true, but Kevin/Pilar and Zach/Ashleigh are getting awfully close. Im rooting for Pilar too and Im hoping that its just because shes trying to lay low for a bit and letting other people become each other’s threats. She’s really only on the radar of Naeha’s. Johnny doesnt seem to want to get rid of her yet but only to put her up as a pawn. Sarah is trying to get into her ear to work with her. Willow believes that she can trust her. What unfortunately helps her is that everyone sees Kevin/her as a showmance and it looks like most of the house supports them being together. Zach/JP want to do a new operation triple date plan and Graig even told Kevin that he wants to keep the good girls (ie Ashleigh/Pilar for as long as they can) and get rid of people like Naeha and Sarah. Zach & JP are trying to play the “middle” and let both sides take each other. Pretty smart. They’re only loyal to themselves. And shy would naeha put up Zach? They talk game and it’s foolish to think he has her back. 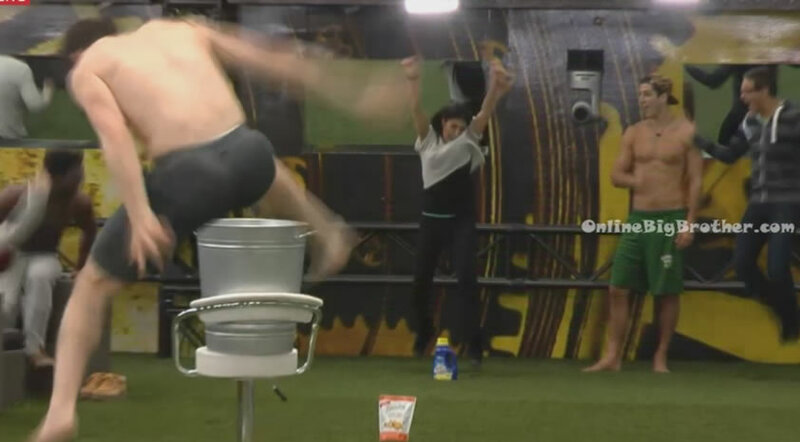 I have a feeling graig will win next HOH, all of the guy are throwing it.